OUT OF STOCK: Sorry, we are currently sold out of the '4" x 6" Travel Pocket Leather Photo Album*'. If you have further questions, please call our customer loyalty team at 1-800-793-3924. Memories are a treasure that should be carried with you wherever you go. Luckily the Travel leather photo album lets you do just that. Large enough to safely store and protect up to 36 standard sized photos, this case will allow you to easily and safely carry an entire picture album with you wherever you go. This is great for regular travelers or people who just love relishing the treasured memories of their past. 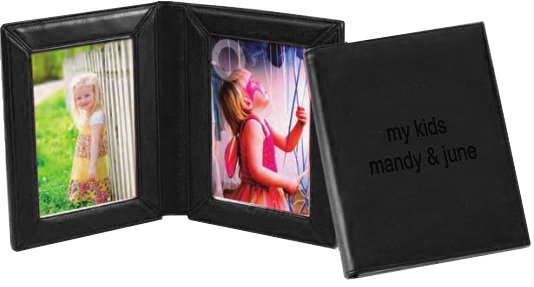 This travel pocket album is crafted from pure black leatherette which has a soft, lush texture. 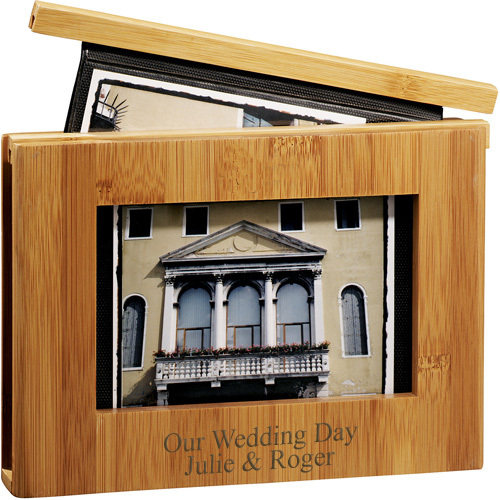 The piece flaps closed to safely store your photos and flaps open to allow you to sort through them. You can carry real, physical, dimensional photos that you and your friends can feel in your hands. The front of the case has a silver magnetic plate that allows it to snap shut and stay shut. You also have the option of having a custom name, word, or initials engraved in its surface, allowing you to completely personalize the piece. One clever idea is to use this as a romantic gift for someone you love. Have both of your names engraved on the name plate, and then fill it with pictures of the two of you enjoying special moments together. Those are the kinds of meaningful presents that will really make an impression on someone you care about. The album was a perfect fit for the wedding pictures I did for my husband he absolutely loved them!